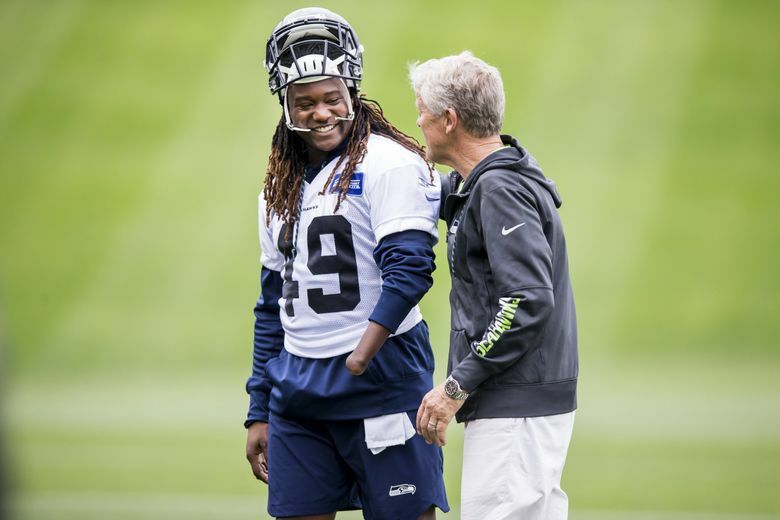 Ranking the Seahawks’ roster: Where does Shaquem Griffin and his competition make our list? One of the team's most visible new players projects to be a backup in his first season. Tailbacks, defensive backs are also featured prominently as our countdown to training camp continues. Our Seahawks ratings continue with players 31-45. Potential role in 2018: Backup weakside linebacker to K.J. Wright and special teams player. Why he’s ranked here: One of the team’s most visible new players projects as a backup in his first season because he will be used at weakside linebacker behind veteran Wright. Griffin wouldn’t logically beat out Wright for the spot this year but can put himself in line to be the successor there down the road if needed. Seattle could also find some sub packages to use Griffin in and he figures to be a core special teams player. Potential role in 2018: Backup tight end. Main competition: Nick Vannett, Tyrone Swoopes. Why he’s ranked here: The UW grad projects as the team’s third tight end and used often in multi-tight end sets, largely in in-line blocking roles. But the chance is there to move ahead of Vannett and get the second TE spot behind veteran Ed Dickson. Potential role in 2018: Rotational defensive line player. Main competition: Branden Jackson, Rasheem Green. Why he’s ranked here: Jefferson can play both inside and outside and had some decent moments in limited time after returning to the team last October. But he’ll have to fight for a roster spot. Potential role in 2018: Backup guard. Main competition: Willie Beavers, Marcus Henry, Skyler Phillips. Why he’s ranked here: An undrafted free agent a year ago who played 48 snaps last season, Roos will have to stave off some of the newcomers to stay on the roster. Potential role in 2018: Starting punter. Why he’s ranked here: That he was taken in the fifth round indicates a high probability that Dickson makes the team this season ahead of veteran Jon Ryan. No doubt, the team seems really excited about some of his unique kicking skills honed in his years growing up in Australia. But the team says it will give Ryan every shot to keep the job he has held since 2008. One thing to watch is how quickly Dickson takes to holding for field goals, a job Ryan has also handled throughout. Potential role in 2018: Backup free safety. Main competition: Maurice Alexander, T.J. Mutcherson. Why he’s ranked here: The role of Thompson, a fourth-round pick in 2017, could grow in both scope and importance if Earl Thomas is traded or holds out for a lengthy period. If Thomas returns, Thompson will again battle for a backup role (which in theory puts him in competition with any of the safeties). But if Thomas is gone, the Seahawks could throw Thompson into the battle for the starting spot. Potential role in 2018: A significant role in the receiving rotation. Main competition: David Moore, Brandon Marshall, Jaron Brown, Marcus Johnson. Why he’s ranked here: The Seahawks are counting on a significant uptick in Darboh’s second season. He played sparingly in 2017 after being drafted in the third round. His draft standing indicates he’ll get a really long leash to show what he can do. But the late addition of veteran Marshall could enhance the competition depending on Marshall’s health and ability to turn back time. Potential role in 2018: Backup everydown tailback and third-down back. Main competition: J.D. McKissic, Mike Davis. Why he’s ranked here: This year feels like make-or-break time for Prosise, whose chronic health issues have limited him to 11 of 32 regular season games the past two seasons. He was healthy in the spring, though, and if healthy this year might finally fulfill the promise he has shown in brief spurts as a two-minute back with the ability to fill in on early downs, as well. But the Seahawks say they are comfortable with the receiving ability of their five tailbacks, so there are options other than Prosise for that this season. Potential role in 2018: Backup weakside linebacker and special teamer. Why he’s ranked here: Alexander, acquired in a trade for Kevin Pierre-Louis last year, battled nagging injuries last season and was limited in the spring. But he made the Pro Bowl in 2016 as a special teams player and he projects again as a core special teamer for Seattle and backup behind K.J. Wright — Alexander filled in for Wright last year against Jacksonville. But he’ll get stiff competition for that spot from Griffin. Potential role in 2018: Backup at guard and tackle. Main competition: Jordan Roos, Willie Beavers, Skyler Phillips, Isaiah Battle. Why he’s ranked here: A third-round pick in 2016, Odhiambo started seven games last season at left tackle in place of the injured George Fant before suffering a hand injury. 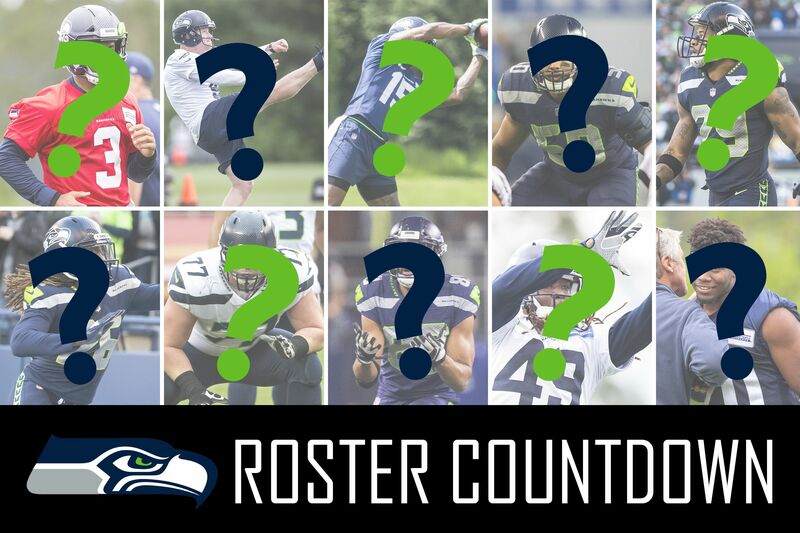 He won’t start at LT this year with Duane Brown around, but the Seahawks will likely throw him into the competition at guard and maybe right tackle and see if he can at least fill the role of a swing backup on game days. Potential role in 2018: Backup tailback and third-down back. Main competition: C.J. Prosise, J.D. McKissic. Why he’s ranked here: Davis was the starting tailback when last season ended. But Chris Carson’s return and the addition of first-round pick Rashaad Penny likely leaves Davis battling for a backup and rotational role. One key will be to show he could handle the third-down role, if needed. He showed promise catching last season, with 15 receptions in 18 targets. Potential role in 2018: Backup cornerback and core special teamer. Main competition: Tre Flowers, Dontae Johnson. Why he’s ranked here: Thorpe has been one of Seattle’s best special teams players the last two seasons — his 320 special teams snaps were 40 more than anyone else. That alone gives him a leg up on a roster spot. But a contract that includes a $2.15 million cap hit with just $300,000 in dead money could make him vulnerable if the Seahawks think they can get similar production more cheaply, specifically from Flowers, a rookie the team will attempt to convert from college safety to corner. Potential role in 2018: Starting or backup strong safety. Main competition: Bradley McDougald, Delano Hill. Why he’s ranked here: Alexander started 23 games from 2015-17 for the Rams at both free and strong safety. He sat out the spring rehabbing a shoulder injury that ended his 2017 season, but the Seahawks list him as a strong safety and he’ll likely compete there when camp begins. Depending on what happens with Earl Thomas and what the team sees in Alexander, it could give Seattle some options in how to configure its secondary. If Thomas is back, then Alexander looms as an able backup at both spots. Potential role in 2018: Rotational defensive lineman. Main competition: Dion Jordan, Rasheem Green, Quinton Jefferson. Why he’s ranked here: Jackson had some solid moments in 12 games last season after signing with Seattle in October, largely in a Michael Bennett-type role playing outside on base downs and able to move inside on passing downs. With Bennett gone, Jackson could be in line for a larger role this season. Potential role in 2018: Backup tackle. Main competition: Germain Ifedi, Rees Odhiambo, Isaiah Battle. Why he’s ranked here: Fant entered the 2017 season as Seattle’s starting left tackle before suffering an ACL in the preseason. With Duane Brown on board, he won’t get the LT spot back anytime soon. But once fully healthy — he is expected to be ready for training camp but will undoubtedly need to ease into things while coming off such a significant injury — he will be thrown into the battle at right tackle with Ifedi. If he doesn’t beat out Ifedi he could stick as a backup at both spots.